It's Back! The Fourth Writers' Platform-Building Campaign. Rachael Harrie over at Rach Writes is the host and creator of this awesome platform designed to link writers, aspiring authors, beginning bloggers, industry people and published authors together with the aim of helping to build our online platforms. 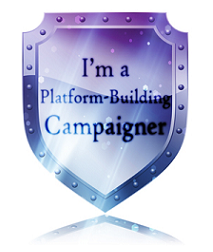 The campaigners are all people in a similar position, who genuinely want to pay it forward, make connections and friends within the writing community and help build each others' online platforms while at the same time building their own. Rachael explains the idea behind the campaign here. Here is a post by Rachael, explaining what it means to be a campaigner. This is an excellent opportunity to make friends and build your online presence while helping others do the same. This campaign will be a mini campaign. Here is a list of the campaigners for the fourth Campaign. You can also sign up here and add your name to the list that best describes your genre. You need to be a follower of Rachael Harrie's Blog. For more information & to meet Rachael's co-host. Visit her blog now. Yay! It's great to have her campaign going again. Every time I see someone joining I get a little depressed that I'm not doing it this time. I love doing her campaign, but I know if I'm going to reach my writing goal for finishing my first draft, I need to take a back seat on this one. Can't wait to see your posts tho. Have fun! week, with very smiles and peace. Greetings from Brasil!